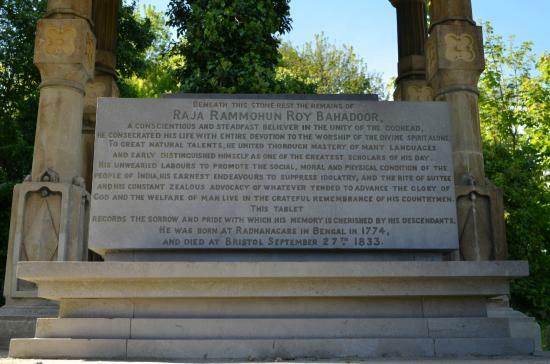 Raja Ram Mohun Roy, the man often referred to as the 'Father of Modern India' is buried in Bristol- his final resting place - an ornate grade 2 listed tomb at Arnos Vale Cemetery in the city, has recently been restored to its former glory. His commemoration services will held this year there on Sunday, the 30th of September 2018 at 12 pm. Roy is remembered in India particularly for founding the Brahmo-Samaj, the Hindu reform movement, and for his work in fighting for women’s rights, including an end to sati, the practice of widow-burning. In 1830 Roy travelled to the UK as an ambassador of the Mughal Empire to ensure that Lord William Bentinck’s Bengal Sati Regulation, 1829 banning the practice of Sati was not overturned. He died at Bristol in 1833.